Today let's take a small virtual tour around the world and see how some really whimsical business interiors created fantastic brands for the businesses! I hope you enjoy my personal selection of the interior branding examples. In our Green News corner, take a look at the new invention by a local San Diego entrepreneur. QwinQwin treeHUGGER sleeves will allow you to quickly display your potted plants and enhance your home and office environment without having to worry about re-potting plants as soon as you finish your plant shopping. I hope you enjoy this November Newsletter! Your image is your brand which also provides a glimpse of the quality of services you are offering. Tired of the same boring interiors all around you? Take a look at following businesses which are quite successful in interior branding. What do you think? If you missed our newsletter on Suggestive Selling in Retail Environment, check it out HERE. 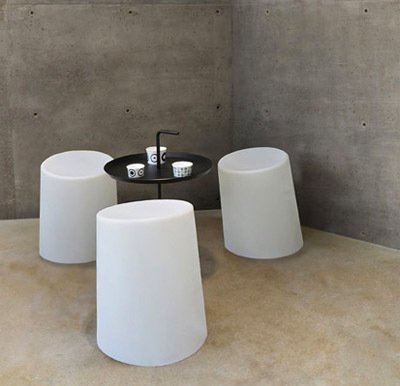 By creating a sharp contrast between raw concrete and soft furniture pieces, a new exciting brand appeared. This London ice cream parlour called Polka Gelato, clearly breaks all the traditional rules of balancing out the use of different materials. The gelato cups, packaging and signage were all branded in similar monochromatic palette and geometrical patterns. The only bright colors you will find in this gelato store are inside the gelato display case. See more images HERE. This small bakery was designed with chocolate and freshly baked bread in mind. Omonia Bakery is in Astoria, Queens, a next-door addition to the corner cafe. 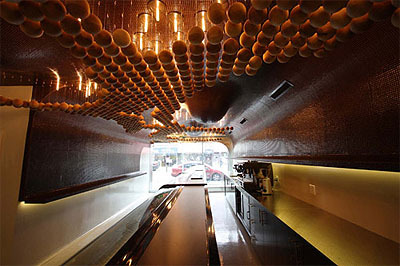 The chocolate effect was achieved by using small brown tiles (1/4" Bisazza) on freely flowing walls and the ceiling. An imitation of fresh dough hangs suspended from the ceiling which is actually red cedar wood spheres. The spheres are lit up by 6" incandescent light bulbs. To see more images of this business interior look HERE. 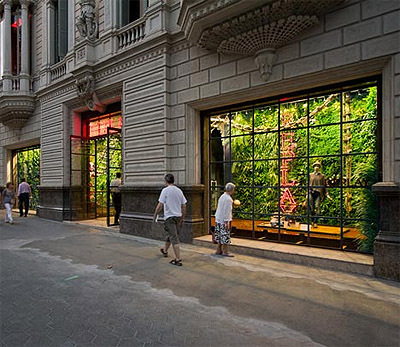 "Replay", Barcelona boutique store, is a green jungle of bushy ferns and begonias surrounding displayed products. Whimsical looking mannequins and giant spiders occupy the vitrine, in front of the green wall. Landscape architects Vertical Garden Design created this interior garden and a second green wall facing a rear courtyard. See more images of this whimsical interior HERE. The Camper store in Tokyo was recently completely remodeled and rebranded. The inspiration for the design came from the circus: red and white stripes. The overall interior color of the store is white. Even the images on the walls have a white background with the brightly colored products being the main focal point. See more HERE. 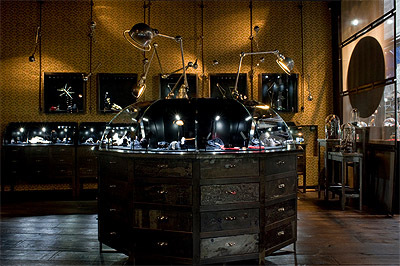 This sophisticated jewelry store was opened in Paris by the Podium Fashion Group from Moscow. Interior designers recreated neogothic interior by using aged textured wallpaper, antique wood furniture and aged metals. I love the central piece – massive armoire with the bubble of glass over the top at the center of the room for display! See more images HERE. When you purchase a new plant for your office or home, you are suddenly faced with the dilemma of purchasing an expensive pot that will compliment the office decor without going over budget. Ceramic pots can be too pricey and trying finding the prefect fit may be too time consuming. The patent pending QwinQwin treeHUGGER offers the perfect solution to this problem! Read more HERE. Copyright (C) 2011 Mindful Design Consulting. All rights reserved.